If it's Friday, it must be Offal of the Week! Brought to you by Ryan Adams, author of the blog Nose to Tail at Home, each week we highlight a different part of the animal that you've always wanted to work with, but were afraid to ask your butcher for. This week: Fatback. I've written about my love of pig parts in this space on multiple occasions, specifically calling out what about each part tickled my culinary fancy. And predictably I'd go out of my way to mention the wonderful properties that the unctuous pork fat brought to the table. Well it's time to cut out the middle man and get to the real reason people love pork: the delicious, lip-sticking fat. And there might be no greater source of that goodness on the entire animal than fatback. Fatback is quite literally named: it's the fat taken off the back of pigs, usually with the skin still attached. In its various forms, fatback has been an important piece of meat for ages. 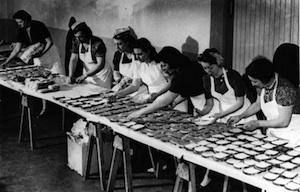 The Italians used cured fatback to feed people doing grueling manual labor in stone quarries: the high calorie content kept the workers sufficiently fueled for their back breaking work. In multiple European cultures, fatback was added to many different kinds of charcuterie to impart more flavor and texture, or for making specialty bacon. And during America's great depression, fatback was the meat of choice for many people because of its cheapness. These days, fatback can be found all over the place in some fashion or another due to its chameleonlike properties. One of the most well known uses of fatback is rendering it into lard, which is where the fat has been melted to remove impurities and then re-set, producing the snow-white shortening beloved by bakers, potato-roasters, and other fans of the delicious. Cured with spiced salt mixtures and left to hang, fatback turns into the highly prized Italian all-fat salume lardo (try it on pizza, famously, at a number of Mario Batali's restaurants). The French like to use fatback to enrich terrines and pâtés, or cut into ribbons and added to game birds under the skin to protect the lean meat. The French also practice a technique called, literally, larding, where strips of pork fat are actually sown into meat with a specialized needle. Pork rinds, scratchings, cracklings, and chicharrones can all be made by deep frying fatback until the attached skin becomes golden brown and crunchy. To find fatback, you'll probably want to head straight to your local butcher, an Asian market, or a friendly farmers market pork purveyor. I was able to purchase five pounds of fatback already cut into perfect rectangles from my butcher, though it did take a few days for it to arrive — you'll want to take delivery time into consideration and plan ahead, since it's not a commonly sold cut. You should also consider buying more than you'll want, as fatback freezes exceptionally well — not to mention that once you start cooking with it, you won't want to stop. 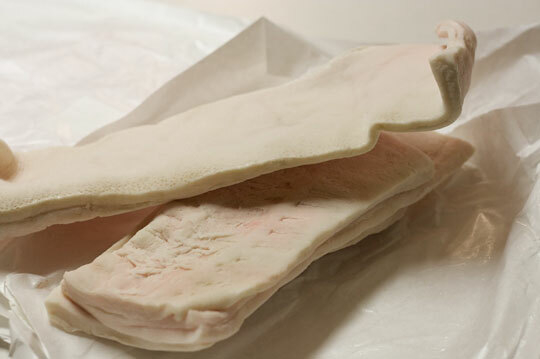 When not frozen, fatback will last about three days in your refrigerator before going rancid. If you can embrace the idea of using pure fat in your cooking (and really, it's not so different than olive oil or butter, except that it's more delicious), then we've got some recipes ready for you! We serve it the first night of our cooking school in Italy. By the end of the week students want to try all the varieties! I like it sliced very thinly, almost melting, on toasted olive oil brushed bread. Lets not even start on Lardo di Colonnata! YUM. PLEASE, PLEASE, PLEASE, help create a market for it here in the US. What a coincidence! i was at grocery store the other day and they had fatbacks for really cheap. I wanetd to get some but i couldnt figure out what to do with it.. Now i do! I love fatback and here in the South there are a number a great uses for it. Pork rinds being among one of my favs. I love to spice them up with some heat as well. That some mighty fine looking fatback. My grandparents were from North Carolina and I ate fatback all the time as a kid when I visited them.